In 2014, India recorded a 12% seasonal rain deficit with a record drought in the month of June. 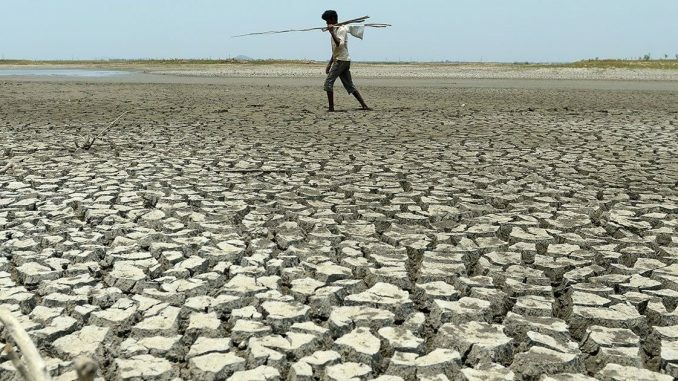 Scientists from the Department of Meteorology and Oceanography at Andhra University studied the climate data and found that divergence of water vapour was one of the main reasons for the drought. The analysis of the moisture transport patterns revealed that convergence and divergence of water vapour are important factors governing the Indian summer monsoon rainfall (June to September). The results were recently published in Climate Dynamics. Data from June 1 to September 30 for the period 2000-2014 were collected from the Climate Forecasting System model at the Pune’s Indian Institute of Tropical Meteorology (IITM) and National Centre for Environmental Prediction (NCEP) final analysis from the U.S. The data showed that all parts of the country had received scanty monthly rainfall at least once during the four months in 2014. The overall seasonal rainfall over India was 775.5 mm which is a 12% less than the normal. The researchers examined the water vapour transport as earlier studies by others had shown it could affect rainfall. “We measured the water vapour transport along the surface layer of the earth to the region of troposphere with 300 millibar level of atmospheric pressure,” explains Dr. B.R. Srinivasa Rao, research associate at the university and co-author of the paper. The divergence of moisture flux could have caused the low rainfall in June which was only 57.5 % of the average. In August 2014, there was a break in monsoon with rainfall only over northeastern and central parts of India. The regions with rainfall showed convergence of moisture and in the areas with no rainfall there was divergence. In September, the rainfall over many parts of India showed significant increase and also excess in some parts. The overall rainfall was 108.1% of the average. These values support the contention that over the land, moisture flux has a major influence on rainfall. “Our oceans are getting warmer and the temperature gradient between land and ocean is becoming increasingly less. So we need to study and analyse the mechanism of moisture availability to land from sea. Our study shows that by measuring the convergence and divergence patterns of the water vapours we can predict the rainfall and drought trends,” says Prof. S.S.V.S. Ramakrishna from the Department of Meteorology and Oceanography at Andhra University and first author of the paper. The other physical processes that cause drought were analysed. The El Nino effect on 2014 monsoon rainfall was very small as the air-sea coupling weakened the effect, resulting in ENSO neutral conditions. Earlier studies had shown that there is only very small relationship between Indian monsoon seasonal rainfall and other factors. The intrusion of western Asian desert air towards central India was an important feature for the dry spells. This partially explains the lack of rainfall but not the normal or above average rainfall. Thus the results of this study suggest that the process of water vapour transport is an important physical process influencing the monsoons. The magnitude of convergence agreed with the rainfall in quantity and divergence caused drought. The study emphasises that moisture flux should be taken into consideration for accurate prediction of future climate.